Leslie Green’s love of books began as a child, but her career with books at LSU Press began in 2003. Four years into her time at the Press, The Southern Review, also at LSU, recruited her. In 2011, she was able to work for both when the two literary publishers merged. The Southern Review, started in 1935 at LSU, is a quarterly literary journal that publishes poetry and short stories, and was hailed by Time magazine as “superior to any other journal in the English language.”The Southern Review receives so many writers’ works of creative nonfiction, fiction and poetry that it is only able to publish 1 percent of submissions. LSU Press, also established in 1935, is one of the oldest, largest and highest achieving university presses in the South. It has published more than 2,000 books, garnering over 500 awards—including four Pulitzer prizes. When Green’s 10-year work anniversary approached, her parents, Drs. 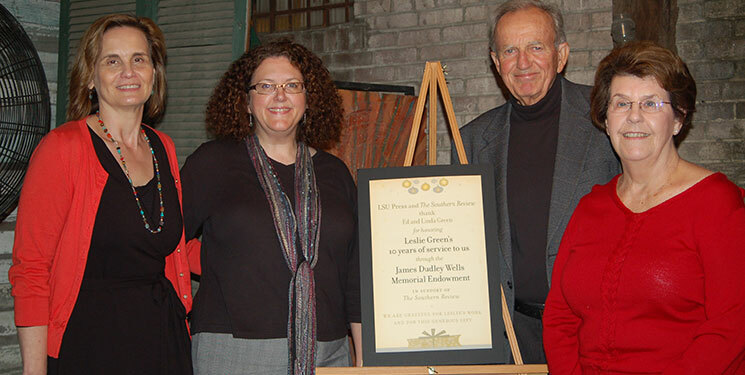 Ed and Linda Green, chose to honor her accomplishment by creating the James Dudley Wells Memorial Endowment, named in memory of Leslie’s late older brother. Leslie said her brother’s voracious appetite for reading is what sparked her own interest in books when she was a toddler. A swimmer, lifeguard and SCUBA diver, Wells studied marine biology at LSU but also loved reading. The endowment supplements The Southern Review’s operations, which are largely funded by the state and sales of the journal. It allows the organization to use the gift where it is most needed, such as enabling staff to attend professional development conferences and bring in authors for readings.